Sgt. 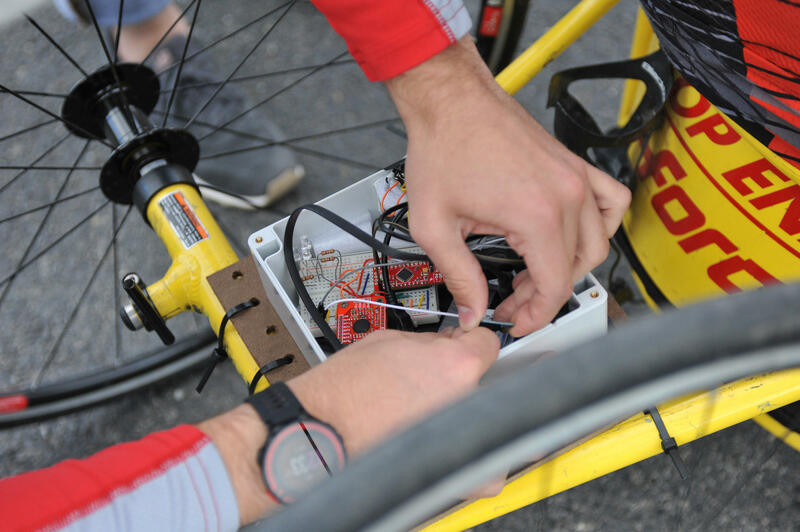 Timothy Brown looks on while UD student team leader Ryan Kronk makes adjustments to the device. Staff Sergeant Timothy Brown is getting used to his new handcycling voice-activated shifting device developed by University of Dayton senior engineering majors. The triple amputee must simply say "up" or "down" for the bike to shift. Brown, injured on his third deployment to Afghanistan, tried out the new device this month. It allows him to use his voice to shift gears and not lose momentum like he had before. The five students, all working on their senior project in conjunction with Quality of Life Plus, built it using existing technology. In this video, you see a few of them looking on as Brown gives the commands of "up" and "down." At first Brown wasn't so sure he liked having to yell at the bike saying "up" and "down." But after trying it out he told the team of five UD seniors he was getting used to it. Brian Yulinski is part of the team and explains how the voice-activated shifting device works. "So if he says, 'up' that sounds different than 'down' and it can discern which word he is saying and it sends the appropriate signal to a micro-controller which opens and closes an appropriate relay to start a shift on the electronic shifting system that's installed on his bike right now." It's Matt Huntington's job to figure out the packaging. "Right now it's fairly large. We kind of strapped it onto the back of his bike. We're currently working to get everything on a current circuit board and really reduce the size." He also wants to pad it to prevent it from breaking if it gets dropped. Eventually the voice-activated shifting device will fit inside a water bottle cage. Kronk adjusts the wiring of the device. Quality of Life Plus has helped a long list of veterans and first responders. Among them, a treadmill centering device for a blind veteran; a tire cleaning device for a veteran who likes to take her wheelchair outside; and a device so a wounded veteran can work her core and sides after losing her right arm and shoulder.